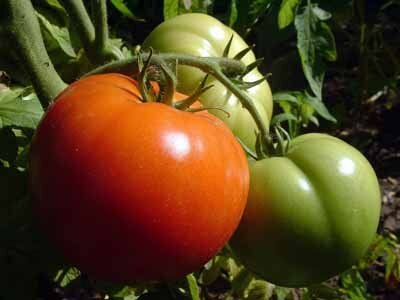 The most popular vegetable to grow in your garden is the tomato. The reward of a good crop far outweighs the work involved because there is nothing that tastes better than a “just picked” home grown tomato. Growing tomatoes is not restricted to the outdoors and it is actually common to grow them indoors throughout the year. A greenhouse is ideal, but all you need is a well lighted area like a sunny, south facing window sill and if you start a new plant every couple of weeks; you can be assured of a continuous flow of ripe juicy tomatoes for your personal consumption. If you decide to grow miniature tomatoes such as the Small Fry or Cherry variety, start with an egg container and fill it will a starter mix soil with fertilizer added. Place the seeds (more than one in each section is fine) ¼ of an inch deep in the soil and water them. Create your own greenhouse effect by covering the container with plastic and place it in a warm sunny area. For larger varieties plant one seed in each section and transplant them into their own containers when they germinate and grow at least one inch tall. All variety of tomato seeds will germinate in 5 to 8 days. Remove the plastic when you see the shoots pop up. To assist with indoor lighting, especially in cold cloudy months, you will need to use two or three florescent lights. Keep them on the plants at least 12 hours daily. Fertilize with a liquid all-purpose fertilizer every two weeks and water regularly. As the plant is growing be sure to watch for insects and disease. If you notice brown or black spots, this is fungus on the leaves and they should be removed immediately so that it doesn’t spread to the rest of the plant. When the plant grows about a foot tall, it will need to be transplanted into a one gallon container to accommodate the growing roots. At this time you should add a stake and tie the stem loosely to it. In 6 to 8 weeks, your plant should begin to show fruit. The fruit is ready to be picked when their color is rich and glossy and when they feel slightly soft. If you notice some of the tomatoes are cracked, it means that they have been over-watered. After harvesting the fruit from your tomato plant, pull out the plant and feel free to reuse the pot and soil for your next seedling. 3. When transplanting small tomato plants, be sure to deeply bury the plant. Don’t be afraid to bury 50 to 75 percent of the plant. It’s okay to bury the lower leaves. New roots will then emerge, giving the plant a “power boost”. Never buy plants that have yellow or brown bottom leaves. 5. Be sure to space the plants the proper distance. It should say on the tomato plant, but if not, then plant 18″ to 36″ apart. 9. 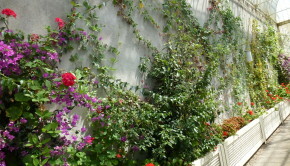 After two weeks, the plants require only 1″ to 3″ of rain per week. As the plants mature, and as the temperatures get warmer, add more water. 10. About two weeks after transplanting, place tomato cages around the plants to help support the vines. Tomato cages are recommended to be about 48″ high. 15. If your tomatoes get “splits” in them, they have received too much water. 17. Plastic sandwich bags can be used to protect fruit from insects, etc. while it is ripening. Just carefully cover the fruit with the bag. Be sure there is drainage and poke air holes for circulation. All plants will die without air circulation. 20. Never be in a rush to plant. Be sure there is no chance of frost occurring. 21. Try planting the tomatoes on their sides by digging a small trench. They’ll get new root shoots, and will likely provide fruit quicker. 26. Never store tomatoes in your refrigerator. They lose their flavor quickly. Instead store on your kitchen counter. 30. Try roasted tomatoes for a tasty treat. Slice tomatoes in large chunks and lightly coat with olive oil. Place the tomatoes in a single layer on a baking tray/dish that is covered with a sheet of tinfoil (aids in easy cleanup). Spice them up with salt, pepper, herbs – use whatever your favorite flavors are. You can also stick entire cloves of garlic in with the tomatoes. Roast at 425 degrees for about 40 minutes, or until the tomatoes are wrinkled and soft. Enjoy!